The taper mounted Griffin Armament Recce 5 suppressor with minimalist muzzle brake. The Griffin Armament Recce 5 suppressor is the quietest 5.56mm suppressor available for testing measuring an impressive 129db at the ear. While the .223 is one of the most popular calibers in the US, it is one difficult caliber to quiet down. .300 Blackout, .308, and even .338 Lapua Magnum tend to register much more pleasant at the shooter’s eardrum than the loud cracking .223. However after my TREK review I contacted Silencer Shop to see which 223 suppressor was the quietest. They in turn pointed me to the Griffin Armament Recce 5 suppressor that metered 129db in their testing. Every other suppressor was above 130db. The end result from my experience is that 223 is still loud and difficult to suppress. Of course having the quietest suppressor most of the goal when making a purchase so why not get the most suppression available? 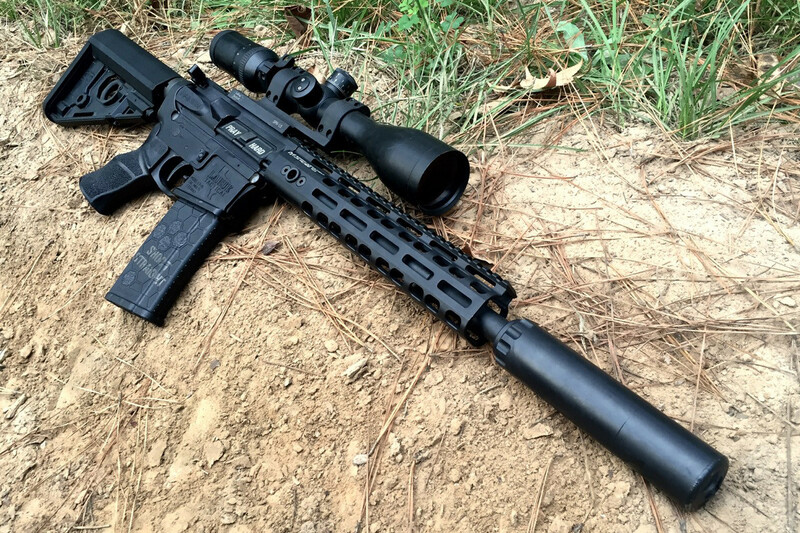 The Recce 5 was designed for 14.5” barrels. Here it is mounted on a 12” LaRue Stealth Barrel. The size and weight of the Recce 5 was similar to my Trek that I have owned for years. It weighs in at 14.5 ounces not counting the muzzle brake mount and is 6.2” in length with a 1.47” diameter. 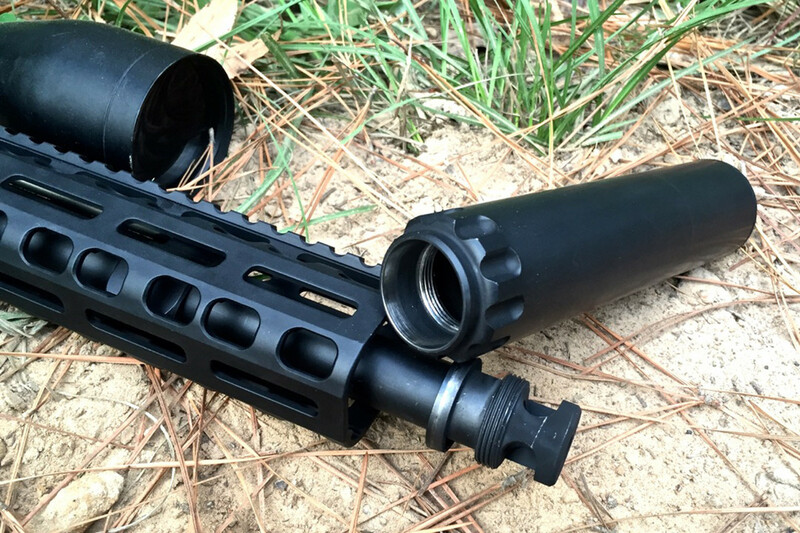 The quick taper mount is an added benefit over a traditional thread on suppressor. In about 5 twists the suppressor is locked into the muzzle brake or flash suppressor due to the taper lock. And I’ll warn you: the taper really does lock in place. When I was testing the Optimus I first threaded the brake into the suppressor to see how tight it fit. Well, I had to thread lock the brake onto a rifle, and then wait until the next day for the Loctite to dry before I could free the suppressor from the mount. Taper locks also offer consistent mounting and low maintenance since there are no ratchets, springs, or moving parts to foul and freeze on you.